We were served fake Tata Tetley tea in a resort in Gujarat. We knew the difference immediately as we use Tata Tetley at home all the time. You can see the off white crumpled tea bag on the left of the image which shows the poor quality of the paper. The logo used is the same but the colour of the blue paper label is also a little different. We brought the fake tea bags home and then placed it side by side with the original tea bags. Without an original to compare to, it was not easy to tell the difference by looking at it. It was the taste that made us immediately realise that it was fake. It was not easy to spot the difference in the way the actual tea looks. The one on the left is the fake one. After dunking in the tea bag the color of the tea turned dark almost immediately but the genuine tea took a fairly long time to get the golden colour. It is obvious that a colouring substance was used. The fake tea had no taste at all and that is how we knew it was spurious tea. We ordered another batch of tea, and then took the fake tea bags home as samples. 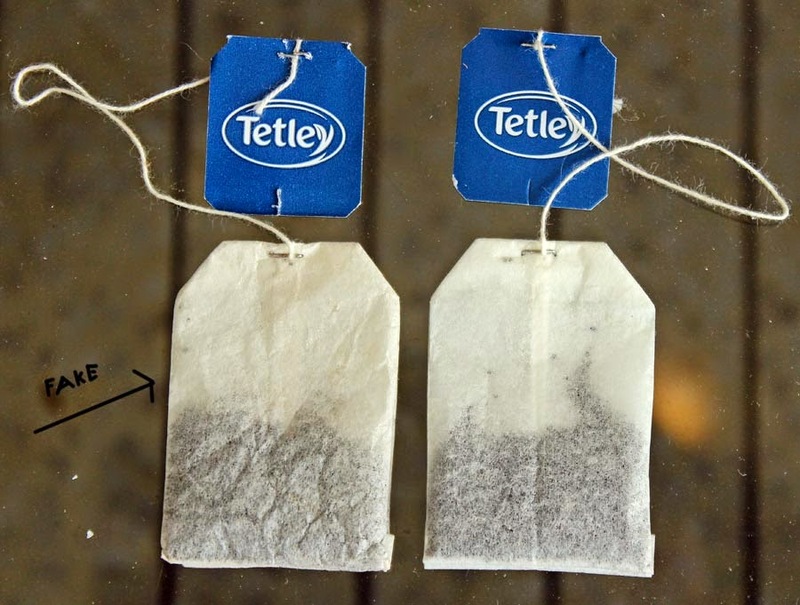 Then compared it to the original Tata Tetley tea bags. The difference was obvious. or try any of the labels below this post.